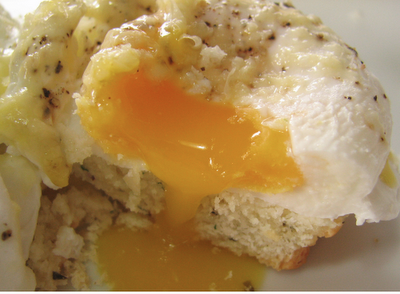 Honey & Butter: Eggs Benedict on a Biscuit! Eggs Benedict on a Biscuit! One of the most comforting breakfast foods are undoubtedly eggs. And I happen to love biscuits as well, so I adapted the classic Eggs Benedict to my liking! Hope you enjoy! Spread baked biscuits with softened butter, and top each one with a slice of bacon, followed by one poached egg. Place 2 halves on each plate and drizzle with hollandaise sauce. Sprinkle with chopped chives and serve immediately.